If your PC or laptop supports lightning-quick NVMe storage, today’s a good day to pick-up one of our favorite SSD drives. Amazon’s selling the 500GB 970 EVO M.2 drive for $117. That’s about $30 cheaper than it was late last week, and $26 cheaper than the 500GB WD Black 3D, a rival with a very slight performance advantage at this capacity. Still, sacrificing a wee bit of performance for a better price is a pretty good bargain, especially when you’re talking about SSDs this fast. We reviewed the Samsung 970 EVO in April and admired it for its affordable price and speed. This 500GB model’s write speeds slowed once the cache was maxed out, but you shouldn’t encounter it unless you’re moving massive amounts of data. In our tests, slow downs occurred after copying about 20GB of a single 48GB file. If you plan on copying 48GB files all the time, perhaps the WD Black at the higher price is a better deal. For everyone else, the Samsung 970 EVO should be more than fine. The key feature of this drive is the speedy NVMe interface that replaces the traditional SATA III protocol for data transfers. For an NVMe drive to work on your PC, however, you need a fairly modern motherboard that supports NVMe. On top of that, some of the earlier NVMe-compatible motherboards wouldn’t let you boot from an NVMe drive since it was cutting edge tech at the time. These days a BIOS update should fix that issue for most people with older components. Check out our lengthier discussion of NVMe issues for more information. 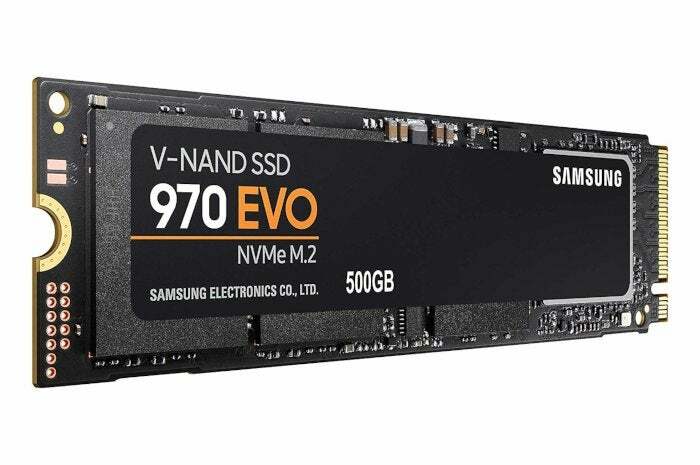 If you can run an NVMe drive, Samsung says the 970 EVO’s read speeds can hit up to 3,500 megabytes per second. Under our tests, it was more like 3,004 MBps—still darned impressive when you consider that Samsung’s fast and always popular 860 EVO SATA SSD tops out at an advertised 550MBps. If you move a lot of data, upgrading to NVMe is well worth it.